But unlike the past, not only that today it is a big waste of time, thanks to our good friend (or enemy) the Penguin, many directories submission can actually HARM your site’s rankings! You see, the Penguin doesn’t really like unnatural links, and directory links are in their essence UNNATURAL. Moreover, Google sees some directories that requires payment for inclusion as paid links which is much worse. And as you probably already know, this Penguin fellow, REALLY hates these kind of links and “rewards” sites accordingly. Common’, 2009? This is old stuff! Many things have changed and developed since then! There’s no way Google would allow and even somewhat encourage this kind of practice in more recent times! Or do they? There you have it guys. Our lord and savior (minus a goatee) back again discussing one more time about the “good” directories with “added value”. Hi Google, after unleashing the Penguin didn’t you just screwed many webmasters that thought it’s OK to submit their site to the “good” directories? Oh, yes you did. Yes you did… But you already know that, right? This is why you apparently began removing many of those spammy added-value-look-alike directories out of your index, right? This is why if I’ll take a sample of 200 directories with PageRank 0 from Directory Critic, nearly 25% are already out of the index, right? 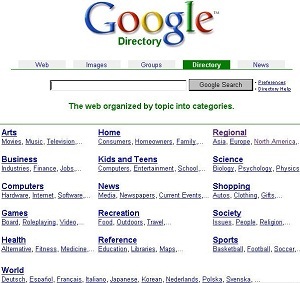 If you don’t know, the image at the top is the old Google’s “good” directory.